Before trying the pulao with bitter gourd, I was wondering how in the world its going to taste. I have made only pickles and pakoras with bitter gourd. This is the first time I tried a pulao with this vegetable. I tried Indira's Karela Pulao and we loved it. The taste was just perfect - bitter, sweeter and spicy. It was just a one pot meal. All I did was to add the cooked basmati rice in the prepared bittergourd. I wanted to prepare a nice raita for this. 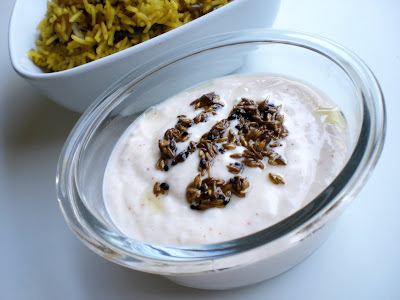 Today Ramki of One page cookbooks posted traditional bengali curries and I wanted to try his bengali style raita recipe from his one page bengali curries. 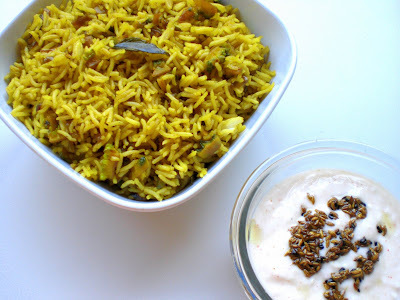 The raita went along very well with the karala pulao. Thanks to Indira and Ramki for sharing such delicious recipes. To one cup yogurt, mixed red chilli powder, salt and cumin powder. For the seasoning, heat half a teaspoon oil and add the cumin seeds and kalonji. Add this to the yogurt. Mix well. Karela pulao goes to Vegetable of the week - bitter gourd/karela event hosted by Pooja. Bengali style raita goes to RCI - Bengal hosted by Sandeepa. Again, Karela pulao goes to One pot wonders hosted by Pavani. Click here to see my entry to Click event hosted by Jugalbandi. I am delighted to participate in all the above events. Thanks to all the hosts. Pulao with Karela new but why not if you are bitter gourd lover right? wow ,t hats lovely way to consume Bitter gourd Mythreyee. btw, i think pavani is hosting MBP for which the theme id one pot wonders . you got to mention form which blog you adapted recipe of it. Indosungod: I can take karela only when it is fried really well. Karela is well cooked in this recipe. So, I love it. I am not a big fan of karela but for a karela lover, as you say will enjoy any recipe with karela. 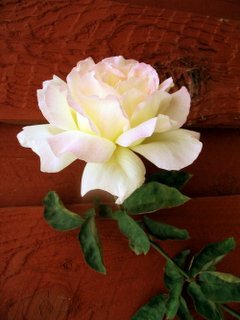 Pooja: Thanks! Ya, this is Indira's recipe. I have mentioned that in the post. I am impressed, Karela and Pulao. I have never thought of such a combo.WOW! Looks very intersting. Good luck for the click entry. it's really a wonderful entry for all those events, Mythreyee! Both the dishes look fantastic. 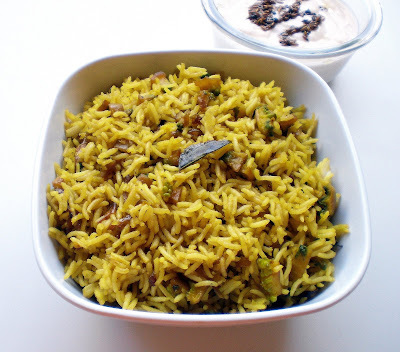 i love karela..but never made rice with it.. so now u are tempting me with this rice recipe. thanks. Just the tadka makes the raita so different, right? Wow karela pulao, never had such a thing. And thanks for the entry. Both sound and look delicious, M! hello!! indian food is really excellent; but not know the vegetarian one!!! nice pictures!!! Raita is not really a part of the authentic Bengali cuisine. Though the preparation here looks good, worth trying out for. But having grown up in a bengali family and been part of bengali cuisine for 3 decades, I was suprised to see this entry in Sandeepa's blog for the RCI event. Dear Anonymous, all I know in bengali cuisine are the sweets. I found this in one of the blogs. This is not my recipe. I was not aware that it is not an authentic bengali recipe. The author of the recipe claims it to be a Bengali style raita as he has used the very common ingredients used in Bengali Cuisine. This is a bengali 'Style' Raita and not Bengali Raita. There is a difference. Thanks for bringing this to my notice. Thanks for dropping by.